#RenuzitSnuggle Sweepstakes Official Rules. WINNERS, ODDS OF WINNING, PRIZES, AND APPROXIMATE RETAIL VALUE (“ARV”): One hundred (100) Instant Win prizes will be awarded: There will be one hundres random computer-generated winning times during the Sweepstakes Period. If you are the first eligible participant to enter at or after one of the randomly-generated times, you will be an Instant Winner. If you are an Instant Winner, you will immediately see a notification on your screen. Each Instant Win prize consists of a Renuzit® Snuggle® Starter Kit. The ARV for each Instant Win Prize is $3.50. The total ARV for all Instant Win Prizes is $350. 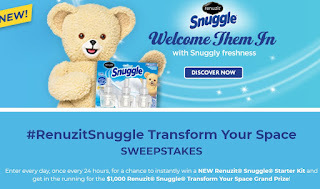 One (1) Transform Your Space with Renuzit® Snuggle® Grand Prize will be awarded: On or about March 30, 2019, one (1) Grand Prize winner will be selected in a random drawing from among all eligible Grand Prize entries. The ARV for the Grand Prize is approximately $1,000 and consists of $1,000 in Walmart gift cards.